Buddhist meditation has its roots in the religion and philosophy of Buddhism. While core Buddhist meditation techniques have remained the same, Buddhist meditation methods have expanded to help the practitioner achieve insight, concentration, tranquility, mindfulness and much more. Base Buddhist meditation has a focus on breathing and posture, and is best learned in a guided meditation course or focused Buddhist meditation retreat. Another root of Buddhist meditation is a focus on loving kindness. We live in a harsh, often unforgiving world, and in order not to become harsh and unforgiving, many Buddhist meditation practitioners find that the conscious, repetitive nature of saying kind, loving meditation mantras to themselves causes negative emotions disappear, and the ability to love increase. While it's not necessary to employ a Buddhist meditation teacher, it is encouraged for you to do so in order to master the basic Buddhist meditation techniques. Then you can explore other types of Buddhist meditation practices. Welcome To The First Monday Meditation. 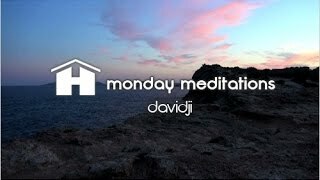 Today's Meditation is from davidji to help focus your energy for the week. Relax and Enjoy!